Birding around Savegre Mountain Lodge was great as usual. 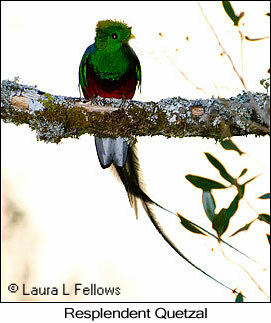 We enjoyed numerous viewss of Resplendent Quetzals including a male in full breeding regalia at a nest and a female with a fledged juvenile male. We also had close-up looks at the strikingly beautiful Long-tailed Silky-flycatcher. We found a Black-thighed Grosbeak nest with 2 nestlings and a Collared Redstart nest hidden in a tangle at the base of a muddy bank along the trail. We greatly enjoyed the hummingbird viewing at lodge feeders, where the prominent species were Green Violetear, Gray-tailed Mountain-gem, Magnificent Hummingbird, and Scintillant Hummingbird. We also saw Fiery-throated and Volcano Hummingbirds, both mountain specialties. Other notable birds we saw included Black Guan, Spotted Wood-quail, Sulphur-winged Parakeets (streaking overhead), Spotted Woodcreeper, Tufted Flycatcher, Yellowish Flycatcher, Ochraceous Wren, Black-billed and Ruddy-capped Nightingale-thrush, Yellow-bellied Siskin, the striking Flame-throated Warbler, Black-cheeked Warbler, Spangled-cheeked Tanager, and Yellow-thighed Finch. We spent part of one day birding Alexander Skutch's farmstead at Los Cusingos. Despite some rainy weather we had fine looks at some southern specialties including Charming Hummingbird, Fiery-billed Aracari, Red-crowned Woodpecker, Turquoise Cotinga, Riverside Wren, and Speckled Tanager. Other notable birds we saw there included Double-toothed Kite, Gray-necked Wood-rail, Black-faced Antthrush, Red-capped Manakin, Blue-crowned Manakin, Long-tailed Tyrant, and Streaked Saltator. In the Talamanca Highlands we spotted a pair of beautiful Elegant Euphonias posing for us in a bare tree downslope from the road. We enjoyed a nice stop at Georgina's Restaurant, where we were enthralled by numerous hummingbirds right outside the glass, notably Violet Sabrewing and Fiery-throated Hummingbird. We also found a Large-footed Finch behind the restaurant. We explored the higher elevation scrub atop Cerro de la Muerte where we had great views of a skulking Timberline Wren and some very cooperative Volcano Juncos. We spent 3 nights at lovely Selva Verde Lodge on the Caribbean slope, where birding is always superb. At the lodge itself we had great views of the oddly different Sunbittern as well as a variety of other birds such as Brown-hooded Parrot, Squirrel Cuckoo, Amazon Kingfisher, White-collared Manakin, Black-headed Tody-flycatcher, and Orange-billed Sparrow. While at Selva Verde we spend a day birding in Braulio Carrillo National Park and another day birding at La Selva Biological Station. Upon our departure we had the great pleasure of watching several endangered Great Green Macaws fly overhead. On our way to Braulio Carrillo we stopped outside the entrance of El Tapir Nature Reserve, where we had the good fortune of finding two Snowcaps bouncing about like flying cottonballs. We also saw Violet-headed Hummingbird, Black-crested Coquette, Blue-throated Goldentail, and Blue-chested Hummingbird there, among others. Birding at Braulio Carrillo is a great experience even if it's rainy, which it was for us off and on. We had wonderful looks at a pair of Tawny-crested Tanagers and a clear look through dense foliage at a very secretive juvenile Collared Forest-falcon. Other notable birds we saw there included Lattice-tailed Trogon, Buff-throated Foliage-gleaner, Chestnut-backed Antbird, Dull-mantled Antbird, Bicolored Antbird, Black-headed Nightingale-thrush, Tawny-faced Gnatwren, White-throated Shrike-tanager, Black-and-yellow Tanager, Dusky-faced Tanager, Gray-headed Tanager, Tawny-capped Euphonia, Black-headed Saltator, Slate-colored Grosbeak, and Yellow-billed Cacique. On our way back from Braulio Carrillo we saw a White Hawk along the road. We also stopped at a wetland, where we saw such notable birds as the endangered Green Ibis and the highly secretive Pinnated Bittern. Our visit to La Selva was memorable as always. The hottest birding was along the entrance road and just inside the entrance. These areas kept us busy all morning. Certainly one of our most amazing finds was a Brewster's Warbler. That was only one highlight among many. These included additional looks at Green Ibis perched in a tree, Semiplumbeous Hawk, Gray Hawk, Blue Ground-dove, Scaly-breasted Hummingbird, Pied Puffbird, Smoky-brown Woodpecker, Chestnut-colored Woodpecker, Wedge-billed Woodcreeper, Fasciated Antshrike, Great Antshrike, White-collared Manakin, Ochre-bellied Flycatcher, White-ringed Flycatcher, Band-backed Wren, Long-billed Gnatwren, Crimson-collared Tanager, Olive-backed Euphonia, Orange-billed Sparrow, and Chestnut-headed Oropendola. In the afternoon we went birding in the deeper rainforest. Near the resident quarters some of us had good looks at Bronze-tailed Plumeleteer. In the forest we had the good fortune of spotting a secretive adult Agami Heron. We also found a Fasciated Tiger-heron, Crested Guan, Rufous-tailed Jacamar, Lineated and Pale-billed Woodpeckers, Northern Barred Woodcreeper and several great looks at the secretive Great Tinamou. We enjoyed some wonderful birding along the Rio Sarapiqui en route to Carara. A stop at the bottom of the road to Colonia Virgen del Socorro produced Torrent Tyrannulet, Scale-crested Pygmy-tyrant, Bay Wren, Black-and-yellow Tanager, Olive Tanager, Bay-headed Tanager, Scarlet-thighed Dacnis, Blue Dacnis, Yellow-throated Brush-finch, and Streak-backed Oriole. We stopped at an overlook to view lovely San Fernando Falls and view hummingbirds at the feeders. There we saw Green Hermit, Violet Sabrewing, Brown Violetear, Green Violetear, Green Thorntail, the near endemic Coppery-headed Emerald, White-bellied Mountain-gem, and Green-crowned Brilliant. En route to Carara we stopped at the village plaza in Orotina, where we saw a pair of roosting Black-and-white Owls. We also saw Three-fingered Sloth loafing in some tree branches and even moving about, slowly, from one branch to another. Our first morning at Carara National Park was devoted to birding the first half of the Laguna Meandrica Trail. Birding there was simply superb. Highlights included Muscovy Duck, Ruddy Quail-dove, Scarlet Macaws, Stripe-throated Hermit, Scaly-breasted Hummingbird, three species of trogons, great looks at a White-whiskered Puffbird perched over the trail, Black-hooded Antshrike, displaying Orange-collared Manakin, a brief look at a Long-tailed Manakin, Golden-crowned Spadebill, Rufous-naped Wren, Rufous-breasted Wren, Black-bellied Wren, Gray-headed Tanager, White-shouldered Tanager, Yellow-throated Euphonia, and Thick-billed Seed-finch. In the afternoon we went birding on the Headquarters Trail, which traverses deeper lowland forest. We saw fewer species there but were rewarded with great looks at Black-faced Antthrush and a Streak-chested Antpitta that hopped its way up the trail in front of us for some distance. That afternoon we also saw Great Tinamou lurking in the undergrowth, Mealy Parrot, Striped Cuckoo, Bronzy Hermit, and Riverside Wren. The following morning found us back on the Laguna Meandrica Trail, further along toward the ponds and resaca off the Rio Tarcoles. At the ponds we were rewarded with four Bare-throated Tiger-herons inflating their necks and chests in frequent displays. We also saw roosting Boat-billed Herons and Black-bellied Whistling-ducks. Back on the trail we saw Squirrel Cuckoo, White-necked Jacobin, Violet-crowned Woodnymph, Steely-vented Hummingbird, Wedge-billed Woodcreeper, Northern Barred-Woodcreeper, Rufous Piha, Northern Royal Flycatcher, Streaked Flycatcher, White-winged Becard, Rufous-and-white Wren, Brown Jay, Blue Dacnis and a good variety of North American migrants and other birds we had seen the day before. That afternoon we took a boat trip down the Rio Tarcoles to explore the mangroves and river mouth. Aside from the more common species, we saw Yellow-crowned Night-heron, Roseate Spoonbill, Mangrove Black-hawk, Mangrove Swallow and the mangrove race of Yellow Warbler. We also saw many interesting mammals during the tour, including Red Spider Monkey, Black-mantled Howler Monkey, White-faced Capuchin Monkey, Central American Agouti, Northern Tamandua, Crab-eating Racoon, Collared Peccary, Variegated Squirrel, and Nine-banded Armadillo.